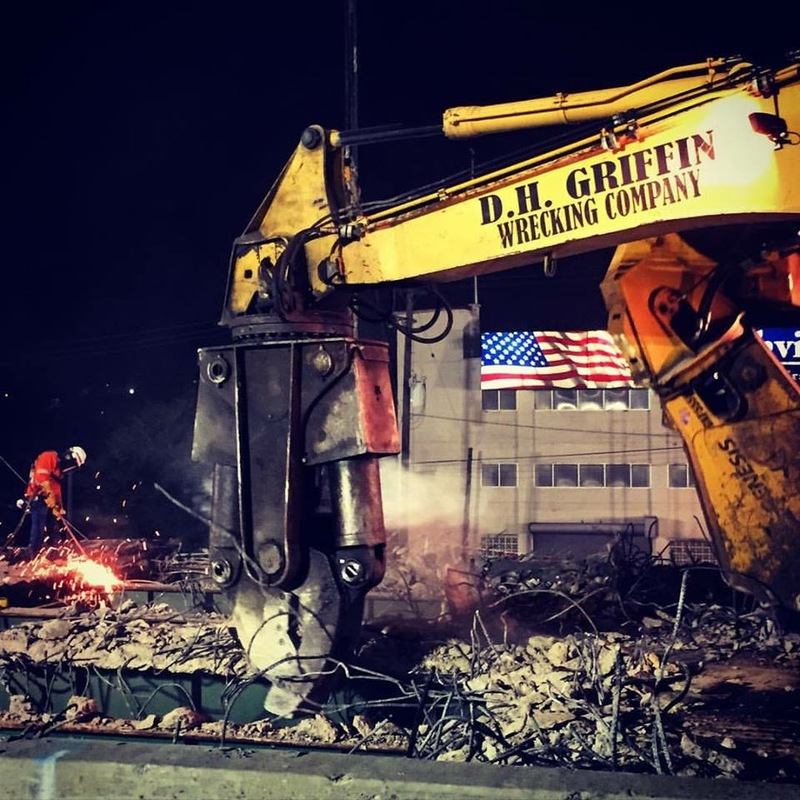 D. H. Griffin Wrecking has been contracted by Kiewit Infrastructures South Company to perform the fast track demolition of (8) I-40 bridges as part of the TN Dept. of Transportation’s Fast Fix Eight campaign in Nashville, TN. The Tennessee Department of Transportation Commissioner is overseeing a major bridge rehabilitation project along Interstate 40 in downtown Nashville. The “Fast Fix 8” project is using accelerated construction to replace eight bridges located on the westside of the south loop. The project will require 13 weekend closures of this stretch of I-40 through June 2016. Built in 1968, the twin eastbound and westbound bridges show advanced signs of deterioration and require near constant maintenance. The rehabilitation project will reconstruct the eight bridges using an innovative process known as Accelerated Bridge Construction (ABC). ABC speeds up construction and repair of highways and bridges by allowing short-term, total road or bridge closures to allow crews the space to do their jobs and the ability to work around the clock. This dramatically reduces the time to complete a project and the long-term inconvenience to motorists. To watch a time-lapse video of this project, please click here. In this video, DHG begins demolition at 8:00 p.m. immediately after the bridge closes and is complete by sunrise the following day. This time-lapse video shows a 48-hour weekend of work for the demolition and reconstruction of one bridge. For more project updates, please visit our Facebook page.